This is a sponsored review from BlogHer and Carrabba’s. However, the opinions expressed are my own. What great things come in small packages? No, not diamonds. Sorry. No, not tiny figurines that collect dust. Yikes … don’t need those. How about food? Don’t we often lament that restaurant portions are just too large these days? Well, you’re in luck … Carrabba’s has recently launched smaller entree sizes (right size, right price) and there are several choices that are on their gluten-free menu. Most of my gluten-free readers probably already know that Carrabba’s restaurant is in the Outback Steakhouse family of restaurants (which also includes Fleming’s Prime Steakhouse & Wine Bar, Roy’s, and Bonefish Grill)—all offering gluten-free menus. Carrabba’s advertises authentic Italian dishes with fresh ingredients. Let’s see if they keep their promise. I’m known for my long posts, but I’m going to try to keep this one a bit shorter and sweeter (yes, there was dessert, too!). Let’s get to what you really want to know right off. We really liked Carrabba’s and I didn’t experience any gluten issues—yippee! Here’s a little more detailed information with photos. Although I will confess right off that these are not award-winning shots by any means. It just seems that restaurant lighting that is comfortable for patrons does not lend itself to the best photos, particularly in the evening. Food: I was asked to check out the new smaller portions. The menu items that were available in smaller portions weren’t indicated on the gluten-free menu (PDF file), so I did have to reference it against the regular menu to see what I could order. The same was true when looking at prices for menu items. (Typically gluten-free menus do not have price information. That way they will stay current unless a food item itself changes; there is no need for the menu to be updated every time prices change.) There is also a specials listing called Less Is Amore, but I did not review or inquire as to the gluten-free status of those items. We ordered the Shrimp Scampi appetizer to share. The gluten-free option simply means it is served without garlic toast. Ordering instructions for this item say “Order without garlic toast.” I really appreciate it when restaurants give this type of info for ordering safely. I’ll be honest here … as I’ve said before, while I love a restaurant with a gluten-free menu, they can give a false sense of security. The fact is it only takes one person and/or one small action to make a meal unsafe to eat. Plus, even with all the training in the world, servers and restaurant personnel are still human beings and will occasionally make mistakes. Reminders such as “order without breadsticks,” are wise. I’ve ordered entrees in other restaurants with gluten-free menus and sometimes been surprised by a bread stick or roll on the plate. An additional note on the gluten-free menu like Outback family restaurants with specific ordering instructions increases the likelihood of a safe experience. As far as the Shrimp Scampi itself, it was excellent. The shrimp were not huge, but still a nice size, and they were plump and juicy in their classic garlic lemon butter sauce with wine and herbs. Entrees come with a choice of soup (yes, there are gluten-free ones!) or salad. (These combinations start at $12.) 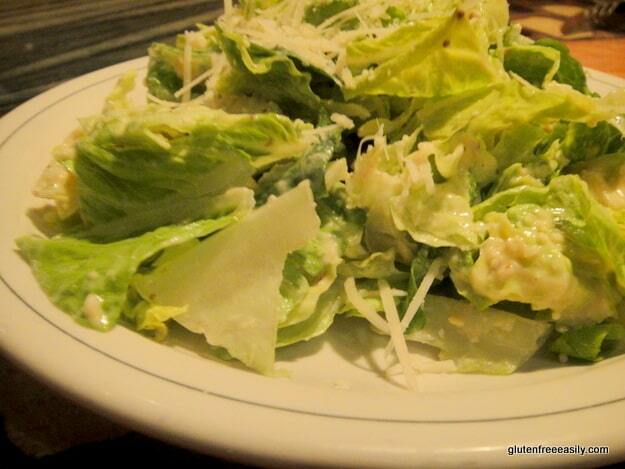 We both opted for salads—Caesar for me and house for Mr. GFE. The greens, and other toppings like Parmesan cheese and Mr. GFE’s croutons (not gluten-free), were extremely fresh and tasty. In the interest of a more thorough review, I ordered two of the smaller entrees. 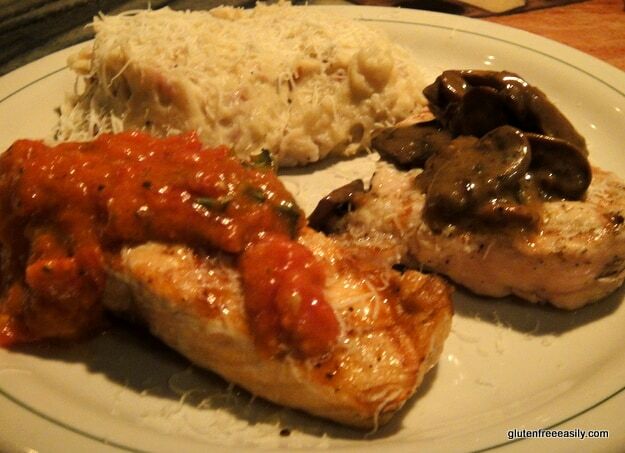 One was Grilled Norwegian Salmon with a tomato basil sauce and the other was Chicken Marsala. The salmon was perfectly cooked and the sauce was good. I admit when it comes to salmon, I really like it prepared simply. I could have done without the sauce. A simple tomato and basil sauce, it didn’t detract and it didn’t add in my opinion. The Chicken Marsala was topped with mushrooms and prosciutto in Carrabba’s Lombardo Marsala sauce. It was cooked well—not overdone—as is the case in many restaurants. The whole piece was moist and flavorful. The Marsala topping added simple, enjoyable flavors. My side dish was garlic mashed potatoes. They were just one would expect—creamy enough, but still with some nice potato texture and “heft,” and just the right amount of garlic. I expected to pay the smaller entrée prices for each of these entrees, but I was actually only charged a small fee ($3) for the second entrée. So, the smaller entrees are also a good value for anyone who wants to sample more than one entree. Mr. GFE ordered a meal that was NOT gluten free, but in the interest of sharing with the non-gluten-free readers, too, I’ll share info on it as well. 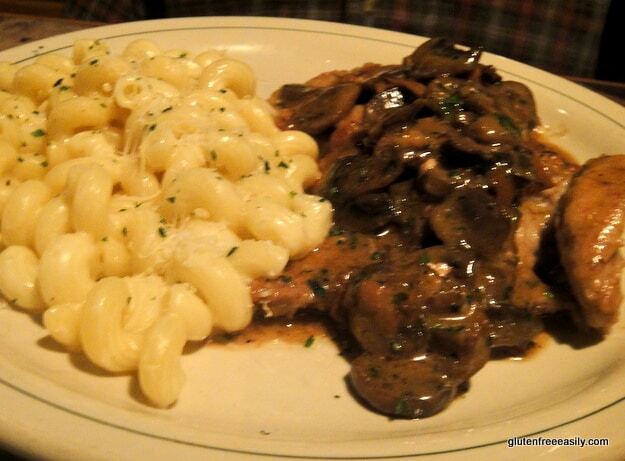 His dish was Veal Marsala, which had the same topping as my chicken—mushrooms and a traditional Marsala sauce. Mr. GFE said it was some of the best veal he’s ever eaten. He ordered pasta as his side, cavatappi amatriciana. I was not familiar with this pasta, but you can see what type of pasta it is from the photos. Mr. GFE enjoyed it very much. We already knew we had to try the one and only gluten-free dessert on the menu—John Cole. 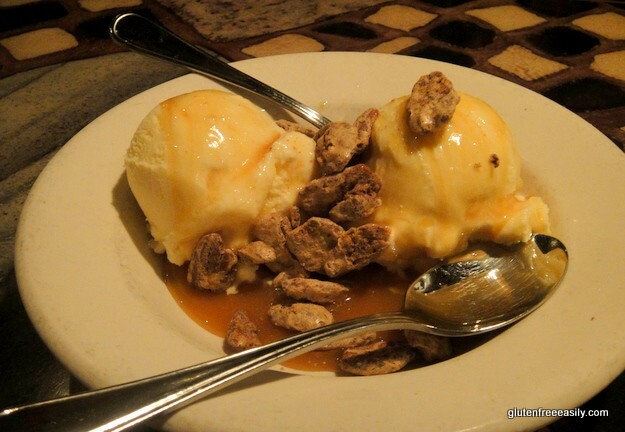 The John Cole consists of Blue Bell vanilla ice cream with caramel sauce and roasted cinnamon rum pecans. As you can see from the photo, it’s a very large portion. It could have easily served four people. Four very happy people. It’s an absolutely delicious dessert. I hope you’ve already figured out that we did not eat all this food between the two of us. Our server placed the better part of both our meals in “to go” containers for us. We both enjoyed leftovers for dinner the next evening and I even managed to get another lunch out of mine. The leftovers were just as delicious as when first served, too. Service: Our service was excellent. We were promptly seated by a pleasant host and our server did a great job taking care of our needs in a friendly, yet non-obtrusive manner. Note that we did arrive after the dinner rush and we enjoy a more leisurely meal than most. Mr. GFE actually said, “This is great. They are on island time.” Let me explain further. In some restaurants we have felt extremely rushed by staff. We have felt like we were being hurried off so the next diners could occupy our seats. It is a fact that we’ll often see other diners arrive at the same time we do, but leave long before we are finished eating. When we are dining out, we like to talk and catch up (yes, even spouses need to do that!) and enjoy a leisurely dinner. Décor/Atmosphere: Some Carrabba’s restaurants are recognizable by their abundant vegetation, which surrounds their establishments, and even tops part of their roof. That greenery does attract your attention and draw you in. And, once you’re in the restaurant, the décor is somewhat standard as restaurants go, but it’s both attractive and comfortable—not too loud, not too bright. We especially enjoyed the comfort and privacy offered by the very large booth in which we were seated. Carrabba’s feels like a very friendly place, too. At the conclusion of our meal, our server, hostess, and even the proprietor all wished us a good evening, with the latter even holding the door for us as we exited. While Mr. GFE and I love to support independent restaurants, we will frequent chain restaurants that we can depend on for a good meal that’s also safe for me. Carrabba’s made the grade plus some, so we’ll definitely return. Now if you are a Carrabba’s fan or would like to check them out for a meal, please enter the giveaway for the $100 Carrabba’s gift card by simply leaving a comment (one comment/one entry per person). You do not have to be a gluten-free reader to enter the giveaway; it’s open to all! Feel free to share any previous Carrabba’s dining experiences, too. The giveaway will close on June 3, 2010. The winner will be chosen by random number generation and notified via email. The winner must respond in 48 hours. Otherwise, a new winner will be selected. But don’t just enter the giveaway here … nine other bloggers are offering their reviews of Carrabba’s with this same gift card giveaway. Check them out at BlogHer.com special offers page, so you can be sure to enter all the giveaways! Finally, click on the following links to learn more: giveaway rules, Carrabba’s menu, and nearest Carrabba’s location. I love Carrabba’s. I didn’t know they had a GF menu. Must try this now. I’ve never been to Carabba’s (or heard of it before this to be honest), but I checked and they have one near my parents house where I’ll be spending a lot of time this summer. So thanks for the chance to win! Wow, I hadn’t realized they had a GF menu either. That is awesome! Another place I can have dinner with my family, and still eat safely. I have eaten at Carrabba’s. Do you have to ask for the Gluten Free menu? Is it stated on the regular menu that they can accommodate GF? WOW! GF at Carrabba’s Awesome! I’ve never eaten there before, but it sounds good! Hi Sharon–I’m so glad that Nina answered your first question. It seems that almost always one has to ask if the establishment has a gluten-free menu. Many times I’ve been pleasantly surprised that restaurants do, but it would be nice if they showed that info on the regular menu. I first talked to my server about how they would prepare my meal to ensure it was safe and then followed up with the manager. They cook gluten-free items on a separate part of the grill well away from the gluten items. I’m sure that statement is to protect themselves from a lawsuit and to caution folks who will not eat anything even prepared in the same area of the kitchen. I was assured that they are well aware of cross contamination issues and do everything they can to ensure gf meals are, in fact, gf. But, of course, use your own judgment. A few other things … first, I’m in the super sensitive crowd like you, and second, while I did not get ill, that doesn’t mean your experience will be the same. There are several who are commenting here though who have had good experiences. Finally, I’d recommend contacting your local Carrabba’s before you visit to see what they say about how they handle gluten-free meals. I often find that the feeling I get from their responses lets me know if I would feel safe eating there or not. Thanks for asking the questions and hope that info helps! I love Carrabba’s. To answer sharon’s question . . . you have to ask for the GF menu, it isn’t included on the regular menu. I’ve been wanting to try Carrabba’s. Thanks for the opportunity! What a great giveaway! I’ve been wanting to try Carrabba’s as I just learned they have a GF menu! Thanks! I love that the Carrraba’s/Outback family has opened their doors to the gluten free population. It makes eating out with friends a little less scary. We went there once on a road trip. It was good and the service as helpful. Hope I win! We love Carraba’s!!! Your meal looks wonderful!! I have never visited a Carrabba’s, but I was hesitant to try their GF menu (it kinda worries me, Italian restaurants with GF menus…) but good to know that you didn’t have issues! I’d love to try it. And I didn’t know that Roy’s was in that same family of restaurants – I’ve wanted to visit, and it’d be awesome if they already had a GF menu! Carrabba’s is a favorite of mine and part of the family is from my hometown! I will have to find a Carrabba’s near me! It’s always good to know about chain options when travelling. I LOVE Carrabba’s! I think their food is amazing. Ooh, it’s been quite a while since I’ve eaten at a Carrabba’s… would love to try it again. Thanks for the chance! I love Carrabba’s!! I went for the first time in December and have been back twice already!! I love Carrabba’s! I would be so excited to win this gift card!! I’ve never eaten here, but would love to try! Love Carrabba’s. Glad to hear about the GF menu. Love Carrabba’s!! Must win!! Please!!! I’d love to eat there sometime, I’ve never been! I’d love to win this for my mother-in-law. I love Carrabba’s GF menu! yum. we love carrabba’s—too bad we don’t have one where I live. Okay now I want chicken marsala and garlic mashed potatoes! I didn’t realize they had a GF menu, but now I like them even more! I had no idea you could safely order a marsala dish in an itallian restaurant! I’m terribly out of the loop—I haven’t heard of Carrabbas before you. We have two Outbacks near by. I’m going to play around with the zipcode finder thingy. Already a fan of Carrabba’s, but previously unfamiliar with their GF menu. Thanks for the thorough review! YUM! I’ve never eaten at Carrabba’s but I’ve heard great things about them. Would love to win this!! I’d love to win! I think my family would enjoy a dinner out at Carraba’s. Thanks for the giveaway! I am truly enjoying your website along with your posts! Keep it up! See you soon! I have seen their new advertisements and have wanted to check out the new menu. I have one of these restaurants close by but have not tried them yet. Would love to win and check the place out!! I’m not gluten-free but have other dietary concerns with allergens…have always found Carraba’s to go above and beyond to check if they weren’t sure on ingredients and to take great notes to make sure nothing was inadvertently added to an ordered item…they’d even ask extra questions like “Are you so allergic that if I touch a plate and then pick up yours, will it be okay?”…I love places where we can go and feel safe while we eat out…and their food is ALWAYS fabulous! I went to Carabba’s once for an anniversary and would love to take my children! I love the Mama’s Chicken Soup sans noodles at Carrabas! I really hope I win! My 5 y/o granddaughter has celiac along with Type I diabetes. Carrabas is a godsend! Thank you!!! As far as eating more gluten free … ideally one should get tested for gluten issues first before undergoing a gf diet or limiting gluten intake. Because doing either of those can skew test results and testing already is not extremely accurate. Testing and diagnosis for celiac and gluten issues can still be a can of worms and have too many “gray areas” unfortunately. First, I recommend that you take a look at the 20+ Reasons That You Should Get Tested for Gluten (PDF file) on my sidebar and this post by Ron Hoggan, Ed.D., Top 20 Things You Should Know About Gluten. Here’s a brief tutorial on testing by. Dr. Vikki Petersen who is the co-author of The Gluten Effect. Of course, some folks look at all the symptoms of gluten issues and just decide to forego testing and go gluten free. A definitive diagnosis is best, but I have seen some folks, even members of my own support group, go gluten free and stick with it. It’s very, very important to note that one must be 100% gluten free if one has gluten issues. If one has gluten issues, there can be serious, even deadly, consequences if one does not adhere to the gluten-free diet. Read more here. Now to get to your original question on reading labels. First and foremost, I recommend focusing on real food and eating gluten free naturally. My one friend describes this food as food you can wash: meat, seafood, fruit, and veggies. After real food, then some mainstream processed foods that are safe and some gluten-free specialty items can be used. Here’s a brief tutorial on labeling from Gluten-Free Living (magazine/website). Note that also on my sidebar under gfe’s tip sheets is a listing of 50 Foods You Can Eat Today (PDF file). This is designed as transitional guidance for when someone is moving from a standard diet to a gluten-free one. It lists real food, some mainstream processed foods, and some gf specialty items. Many are these foods (e.g., treats) are not ones you’d want to eat every day, but they are gluten free. Again, my gfe approach focuses on eating real food that is naturally gluten free. If you’ve watched Jamie Oliver’s Food Revolution series, the food he is showing people to eat, with the exception of say homemade bread/rolls, is naturally gluten free. (BTW, there is a fantastic event going on over at The W.H.O.L.E. Gang right now to show people how to transition to real food. You’ll want to visit The W.H.O.L.E. Gang’s site every day to see what different bloggers have to say. Really great stuff!) Please send me an email later if you need additional info. We love Carrabba’s and I am so excited about the gluten free options. We’ll have to try it! Thank you for the review! We always enjoy finding new restaurants. I am excited about their GF menu! I would love to try the GF menu at Carrabba’s. We have never tried Carrabas restaurant and would love to give it a try. Your food looks yummy! Would love to try Carabba’s gluten free menu. I have only been to Carraba’s when we visited another city where our married children live, but it was a great visit. Thank you for the review. Best to all of you and good luck on the giveaway! My kids love to go there because the wait staff will bring them a slab of pizza dough to play with while they’re waiting for their food. Fun! Love Italian food! Love carabbas! I will always and forever LOVE Carrabbas. For seven! years the Carrabbas in our community opened up and hosted an annual fund-raising luncheon for a fireman family member who was in an accident that broke his neck and paralyzed him from the neck down. They don’t publicize it, but their fund-raising efforts are extraordinaire throughout the country. How nice of you to have an awesome giveaway! And so close to Mother’s Day, too. Never been to Carabba’s. There’s one on the other side of the city so I’d sure like to try it out. Sounds delicious. I’ve never been to Carrabbas but would love to try it. I’ve never been to Carrabbas but have always wanted to try it. Thanks for hosting this giveaway! to” place when we want a delicious Italian meal. I’ve always enjoyed my entrees at Carrabbas. We don’t go that often, but with $100 giftcard we will! Thanks. I have never been before and would like to give them a try. Thanks for the giveaway. 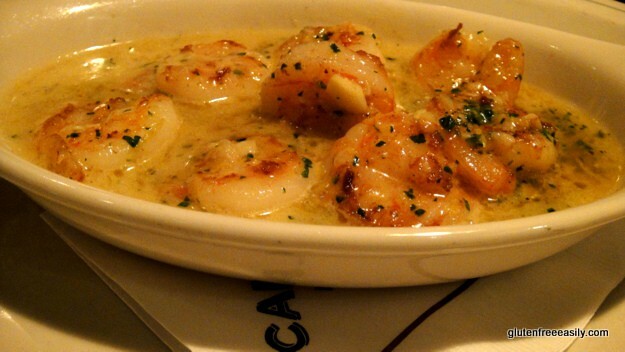 I LOVE their Shrimp Scampi… I am a Carrabba’s fan! It has been at least 10 years since I have been to a carrabbas, I would love to win! Sounds really good. Did you notice if they had any gluten free food that also didn’t have cheese? Hey Aubree– 🙂 Not all dishes contained cheese. There’s a definite emphasis on butter though in most of the dishes on the gf menu. However, it looks like a few have no butter, but are prepared using olive oil. From comments here, I’m guessing that Carrabba’s personnel will accommodate as much as possible. I’d take a look at the gf menu (just click on menu link in my post) and I’d call the restaurant and speak to staff, preferably the mgr or kitchen personnel, to see what they say on serving dairy free. Came here from Steamy Kitchen. Would love to go out to dinner! what an amazing giveaway! Win or not I can’t wait to try this place! Thank you for a very encouraging review. I haven’t eaten at a Carrabas since figuring out that gluten was a problem…Oh were they good! The closest one is an hour away, but I am near it at least twice a month… I would love to see how the GF menu compares to my memories of the non-gf foods. What a fun giveaway! I’d love to take my 3 girlfriends to dinner! I’d love to win this because I’ve never eaten at Carrabas! I’d love to try them out! I love Carrabbas! It is definitely one of our most favorite restaurants. I love Carrabba’s! But I never realized that for an Italian restaurant they took such care to provide gluten free alternatives. Makes me love them even more. I love Carrabba’s. I had no idea that they had a GF menu. My mom is GF so it would be a great place to take her. Thanks! I’ve never been but the food looks fabulous! Thanks for doing the giveaway! We love Carrabba’s. We order 4 different meals and share them. yummy Calamari as well. I love Carrabba’s, but it’s been a little while since I’ve gotten to eat there. You did a great job on your review and I am happy to see they offer the smaller portions now! I hate wasting food, but can’t eat the huge portions! Thanks for the info!! wow! amazing giveaway! if i win, i am soo taking my sister- she hasn’t been since her diagnosis (she is a pasta fiend), but we go to outback regularly and the gfree service there is awesome! i agree with those who are alert and helpful with regards to allergies/intolerances. thanks heaps for the review! We never eat out…it’s just habit from not being able to because of my diet. But, it’s something I’d like to do more often just to experience different foods. I think it’s wonderful that you’re sharing so much good info with your readers about eating out g-free! Mmmm… it’s been awhile since I’ve been to Carrabas, but I do remember that they had great food! Carrabba’s is our favorite date night restaurant! I always have liked Carrabas…they seem to be one of the better of chain Italian restaurants. Thanks for the opportunity to win! Carraba’s is one of my favorite restaurants, and it also offers some low carb options for me, which is hard to find at an Italian restaurant! I have only been there once, but it was a delicious meal. I would love the chance to win a gift card! Yum! I will pass on this information to my GF friends! There’s one where we are moving to this summer. Will for sure give them a try! I’ve never eaten at this place before but I love Italian food so it sounds wonderful. We have always loved Carabba’s. I am in a deep Chicken Bryan rut and it continues to be one of my all time favorite things to eat. I have never eaten at Carrabas, but have heard good things from someone who has. Would love to try it for myself! I had NO idea that they had a smaller portions menu, but I have to say “BRAVO!” to them for providing it! We’ll definitely have to try them soon! Sounds like a great meal!!! Wow, that sounds delicious! I just moved to a town with Carrabas, and I’ve only gone once, but I would love to go back! I would love a chance to win a gift card to Carrabas! It’s been ages since i have been there but we have always liked the food, and yes, the service is good. Since I have gotten more involved with my own real food cooking I never know which restuarants to go to anymore. I am glad to know Carrabas is a good place to go. I just love Carrabba’s! And…now I have an idea of what’s for dinner tonight! LOVE Carrabba’s! Now I’m craving it. Yum! While we don’t have a Carrabba’s in California, we will be visiting states that do have one, next year. I’d love to win the gift card, but it’s also nice to know to look for this restaurant as a safe place for Emily to eat. Thanks! I would never have thought of a ‘pasta’ restaurant as a place for us. I have a wheat senstivity and though I can eat wheat *safely*, it causes unpleasant digestive and skin side effects. I will put Carrabba’s on my ‘to visit’ list. thank you for this website and review! Oh, I just love Carabba’s! It is one of my favorite restaraunts! My husband and I love Carabba’s and although we try other dishes, we have difficulty straying far from the chicken and steak marsala, they are so good. The salmon has always been cooked well. We will definitely be checking out the smaller portions menu. My husband and I love our Lansing Carabba’s and dine there often celebrating various events in life! We rarely eat out because of my gf diet and finances. It would be such a treat to win this gift certificate! Thanks for the opportunity! Their grilled salmon looks great! Our local Carabba’s provided lunch for the nurses on Nurses’ Day at the hospital where I work. It was the first time I’d ever tasted their food. It was incredible! They brought chicken marsala, Caesar salad, and penne pasta with marinara sauce. It was all yummy and much appreciated on Nurses’ Day! love,love,love,Carrabba’s.I left my peepers at home,our kind waiter brought me a pair so I could see my DELICIOUS meal! I have eaten there once off the gluten free menu, it was good, but i wish they had even more options!! I have never actually eaten at Carrabba’s, but it sounds delicious from your review! Especially that shrimp – yum!! AWesome giveaway- I would love to win this so my hubby and I could go on a date night! One great thing that comes in a small package is a kind word for someone. I have been gluten free for over 5 years and feel safe eating at Carraba’s! I am grateful that Carraba’s has taken the time to accomadate gluten free dining. We love Carrabba’s and go there every time we visit our son. I love Carraba’s – it is a great place for “date night” with my hubby or when I bring my kids. I love Carrabba’s. Glad to know they have a gluten free menu too. I’ve never been to Carrabba’s- but I love Italian food! I love Carrabba’s! I never knew they had a gluten free menu. I love Carrabba’s. Every time we visit with family in Sarasota we go to the restaurant to celebrate. I love their appetizer with the melted cheese and sauce that you dip into. Also the Pasta Pescatore is unbelievable. I could eat the whole basket of bread with the herbed olive oil. The Pasta Picci Pacchiu is yummy and the pork chops are thick and delish. Last time we actually went there 2x in one vacation. We never had a Carrabba’s in our tiny town…we just moved and NOW WE DO!!! I have been wanting to try them out forever…all my friends love Carrabba’s and I have heard about the mushrooms…would love to try and this great GF would be awesome to win. Wow, thanks for the opportunity to do so for free. Carrabba’s is expensive, so we’ve only been a few times for “holidays”. Very excited to hear about their smaller portions/smaller price options. Their food is soooo good!!! This is a wonderful giveaway – thanks!! HUGE fan of Carrabbas! I’m keeping my fingers crossed! Thanks for offering the GRRR8 giveaway! My favorite resturaunt of all time…I love their scampi and polla rosa maria chicken…to die for. Hope I win!!! Love Carrabba’s- wonderful food, service, and atmosphere! We love Carrabas, but don’t get to go very often due to our child’s multiple food allergies, including gluten. I must say that the way they have simplified the menu for gf eating makes it so much easier! Thank you, Carrabas, for remembering the rest of us! I am excited to hear you had a good experience there! We’ve been GF about 2 years now…and it is SO helpful to find places where our WHOLE family can enjoy the food! 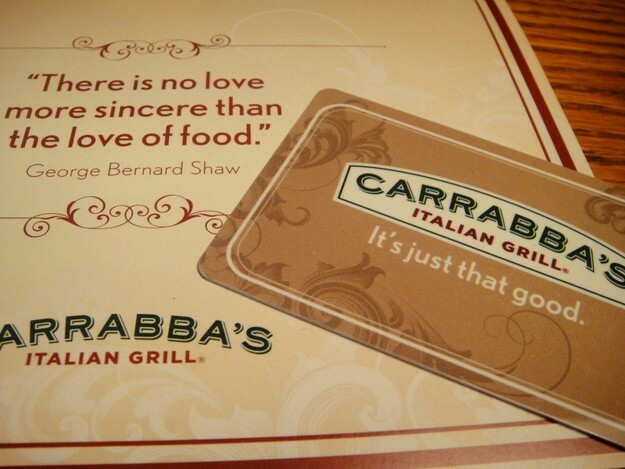 Carrabbas is our favorite “romantic” place to go! and EVERY single time we’ve gone the service is amazing!!! The food is deliriously good! We love Carrabbas!! Ooh! If I win, I need to take my sister here. She has celiac disease and has a hard time eating at most restaurants. Thanks so much! My mom will be 76 in June, I’d love to take her to Carrabba’s to celebrate. thanks for the chance to win. My parents live near a Carrabba’s, and I’d love to give them a gift card to enjoy! I all looks so yummy! have never tried carrabba’s but those pictures look GREAT! I love authentic italian food. If its healthy all the better. Carrabba does it best. Carrabba’s is wonderful! Their variety for all diets is awesome. Love them too…thanks for this giveaway! I love Carrabbas!! Sounds like a fantastic date night! Love your pictures! I would love to treat my family to a night out at Carrabba’s. What a delicious treat. Carrabbas is my favorite restaurant. Looking forward to going there on my Birthday! I love Carabbas! Thanks for the chance to win! I haven’t tried Carrabba’s yet, but would like to try the Insalata Fiorucci and Rigatoni Martino. Unfortunately they don’t have any local here but I love eating there when I go to Vegas. I’m so happy more Good restruants are becoming GF friendly! I’ve only had Carrabba’s through a drug rep take out lunch and it was FANATSTIC, an hour later! Would love to be able to into the actual store. THANKS! this would be amazing for my mom!! thank you so much. Sounds like you had a great meal and great service, always a nice change! I don’t go any where else. I love all of the meals and I have tried them all. I have never been to Carrabba’s! I will have to try them out since I loved your review and photos! I love Carrabba’s but thought I was done with it when I found out that I needed to be gluten-free. I’m so excited to see your review and know that some of my favorite dishes are on the GF menu! I have never eaten at Carrabba’s, it looks delicious. Would love to try this…we’re always looking for places to eat that offer gluten free. Yum! Would love to try Carrabba’s! Oh, those shrimp look lovely. Thanks for the great review. This is one of my favorite restaurants though I don’t often get the opportunity to go. The only disappointment I’ve ever had related to Carrabba’s is the time I left my take-home container in the car overnight. Boo! All that deliciousness had to be tossed. I agree that the normal portions really make at least two if not three meals which makes the price really reasonable. There is a Carrabba’s near my house, but I’ve never tried it. Your review definitely makes me want to go check it out! Will be sure to check the GF menu next time I go there! I had no idea they had one! Thanks! These pics of Carrabbas look delicious! I have never been but have a celiac daughter who would LOVE eating out and knowing she won’t get sick! Thanks for posting these pictures and for all of the info! I’ve never eaten there before but it sounds great. And I would love to try it since they have such great variation in their meals. My brother and I live about 2 hours apart, but there’s a Carrabbas right in between us. Love to meet up there and spend an evening together. Carrabba’s is one of my favorite places to eat – especially on a rare dinner alone with my husband! We usually share the sirloin marsala but with the new smaller entrees we could both try something different. Thanks for the opportunity and the detailed review! It’s been a really long time since I ate at Carrabba’s…which is a shame since there is one less than 15 minutes from my house. My boyfriend is not a big fan of italian, so we tend to go elsewhere. I will have to suggest it for our next girl’s night. I’ve never been in a Carrabbas but I do enjoy their food and would love to actually dine there. Last year before my birthday I seen so many commercials for this one beef brassoto dish and we had planned to go but I broke out in hives/rash that was extremely itchy and ugly I didn’t want to leave the house but my husband stopped and surprised me with take out and it was delicious. I’ve never been to Carrabba’s, but I’d love to try it. I’m going to be much closer than normal to a Carrabba’s this summer, and it would be interesting to try it out. I love Carraba’s! The chicken bryan is SO good!! I can’t wait to go back to Carrabba’s when I return home from college. It’s the best. love Carrabba’s – I had no idea they had a gf menu, good to know! We have only been to Carrabba’s once and everything was delicious. I remember the Calamari being especially wonderful. Thanks so much for all the entries, reviews, and excitement re: Carrabba’s gf menu, folks! We have another week before the giveaway ends. Spread the word and best of luck to all! We enjoyed Carabba’s & look forward to eating there again. At last there’s a common restaurant that I can take my g-f friends to without lots of awkward questions. Good news! I love Carrabbas and it’s family friendly atmosphere. Good luck everyone! Thanks for the review. My sister has to eat gluten free and I am starting to think that it would be a good idea for me, too! Smaller portions would certainly be a good choice. We adore Carraba’s, and have been known to drive the four hours to get to the closest one on a whim! I would love to visit Carraba’s. Have not yet been there, but have heard that it’s wonderful! Looking forward to the opportunity to find out for myself! I would love to go to Carraba’s! We love Carrabba’s! That shrimp scampi looks so good, and ice cream with caramel and cinnamon rum pecans? YUM! The menu sounds so yummy! Nice to know you can eat out and get gluten free. Carrabbas is my favorite restaurant. I had no idea they had a gluten free menu or smaller portion sizes! Good to know! Love to eat out and love to eat at Carrabbas! Hi! Not entering contest, as we do not have a Carrabba’s in California (darn! – sounds great!) I did, however, just post this giveaway on Facebook to these new pages: Gluten Free Giveaways, Gluten Free Giveaway and Gluten Free Give Aways. Good luck everyone! I have not tried Carabba’s yet, but it is certainly on my list to try with it’s gluten free menu. we have a Carrabas and I have never been! shame on me! I need a night out and would love to win this! thanks for the great review! I’d love to win this to take my family out to dinner! Their smaller portions are great! I usually get the Chicken Gratella @ Carrabba’s, but I have to try the gluten free menu. Love Carrabba’s and have never had anything that wasn’t yummy! I’ve never eaten at Carrabba’s and all my friends RAVE about it. If I won this giveaway, it would give me the opportunity to treat my family to some yummy Italian food, with no cleanup for me afterwards! Sounds delicious, hope I win! WHAT A FUN GIVEAWAY….I WOULD LOVE TO TRY CARRABBA’S! I like their chicken marsala, so good! One of my favorite things that come in small packages is JEWELRY! I was so excited to receive an e-mail that I won the contest. I can’t wait for the gift card – my family is going to celebrate the end of the school year with a fancy dinner. Thanks GFE for such a great opportunity! I would love to win. I have never been to Carrabba’s but my friend has and she say’s it is her very most favorite restaurant so they must be really good. TY! Hi Kristi–Welcome to gfe! 🙂 So sorry, but the Carrabba’s giveaway has already ended. Be sure to check my Out and About page for other gfe giveaways though—current and future. Hi Karina–So sorry to disappoint, but the giveaway has actually been closed for a while. Carrabba’s food is delicious. I hope you’ll check back for more gfe giveaways!